We’ve written before about the importance of ranking well in local SEO results. Recently, Google has been putting a lot more emphasis on amping up its ability to provide excellent local search results to its users. This is likely due to the fact that local searches make up a major portion of web searches and often result in a course of action. Want to improve your local and overall SEO? Download this free e-book to learn more! So it’s no surprise that Google is continuing to bolster its local search result efforts with its latest update. 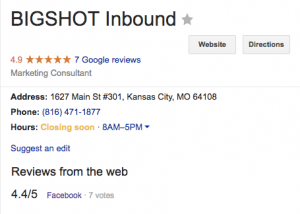 In the local results tab in Google, users used to see the business’s information and Google + reviews. But, as of September 7th, 2016, Google is introducing reviews in the local results window from sites like Yelp, Facebook, and TripAdvisor. These reviews will display beneath Google reviews in the local search results snippet. This update rolled out over a 24 hour period, and we’re already seeing its effect on AGENCY H! Beyond the “Oh, that’s neat” factor of this update, you probably want to know how this will affect your business. 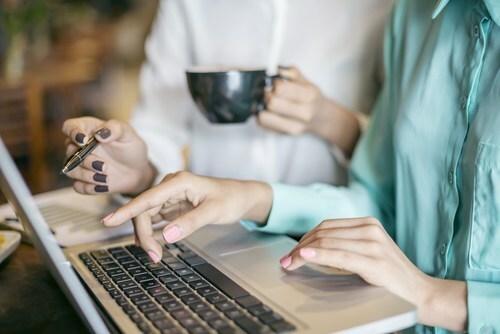 So far, Google has given no indication that this new update will impact a business’s search engine ranking any more or less, but we know from the recent past that Google has put some weight on third-party reviews. What is certain is the impact this update will have on the user’s experience, something we always emphasize at AGENCY H. This update enhances the user’s experience because it displays credible review scores from reputable sites, leading to a further inclination to trust — or not trust — a local business in their search results. So, if you’ve had a steady flow of Facebook reviews, but are lagging in the Google + area, your Facebook reviews will now have more of an impact because they’ll be more easily seen! If your site hosts user-generated rankings, make sure they meet Google’s criteria to be considered for inclusion in the local “reviews from the web.” Google also suggests adding the Local Business markup to ensure the reviews are matched with the right subject. If you have any questions about implementing this criterium, don’t hesitate to contact AGENCY H! We would love to talk to you about getting better reviews, building your web presence, and attracting more clients! Contact us online or give us a call at 816-471-1877!